It’s fun to see the lovely trees! It’s fun to watch them in the breeze! Their leaves rustle and wiggle, too. They give their sounds to me and you! Easily showin’ the Touch, Divine! No matter if we’re short or tall! Bring greens and browns with sight-ly ease. Trees help with this, since days of old! They’ve always been grand Friends to me. A special gift is ours, you see. We Leprechauns can speak with trees. We do this with the greatest ease. They often help us hide our gold. They’ve done this since the times of old. Trees help Leprechauns not be found! With diff’rent helps from day to day. The Maple has some tasty fun! In early Spring its sap does run! A Leprechaun in or out-side! To members of the Irish race! Which can bring hope to the forlorn. By givin’ safety without fail. That it’s a while ‘fore they grow back. Due to the trees they do come from. That help us hide our gold with ease. Make for such lovely forest scenes. They show us secret “welcome” signs. From start of day till the day ends. Not like when trees have no leaves seen. called evergreens, though, they are all. All the news with beauty fine! ‘Specially to each girl and boy! Even my red hair and green Me! My hidin’s good each place I be! Where ’tis not hard to hide my face! Be you yourself or Leprechaun! Think of these lovely thoughts of mine. What a grand Friend can be a tree! Without their help I’ve told to you! With covered places that they’ve made. Where no one can see our faces! To hide in when someone’s nosey! When rain falls hard right from the sky! Helpin’ us again and again. The evergreens still help us all. Their lovely fragrance can be found. In all their greens in many shades. And help me much in many ways! Of how Trees help me every day. God bless you now and every day! There are so many in our land! “Special” red doors I’ll tell of here! About the Leprechaun’s red door. Sometimes we have homes in the trees. Sometimes we need to hide with ease. Sometimes the rocks do help us, too. ‘Tis of these times that I do tell! And, secret work, the Family gives. That secret work that none can see? But, first we must speak of the door. And speak of what the red is for! Many times our doors are not red. Not always red…that’s what I said. When we are inside or outside. So red’s the color that is found! That on the lookout we should be. The red will tell…we need not shout! ‘Tis been the way since days of old. In a very obvious spot. We move quite fast…cover the spot! The red door does some fine jammin’! A Leprechaun, someone does know! Just as he’s done since days of old. And sweep it up, he really must! Might know some gold would nearby be! Just like he’s done from days of old. So color red need not be found. So sun and gold can shine their way! Just like it’s been since days of old. ‘Cause Leprechauns don’t like a fuss! Once through the doors which you now know. Just as it’s been since days of old! Just delvin’ deep in memory. Just hard to figure…how they show. We, Leprechauns, know this is true. Things old for us seem new to you! It helps us know more than we’ve told. To think we don’t know would be wrong. Makes time’s passing, such a great cost. And then called fables…not sure how. To be made up inside my head! Some say its name is Hy-Brasail*. Some other names it’s known by, too. …whose mem’ry time does not erase? Before it rises…waves to break. Why did this horse fly to the West? ‘Tis sure it is so very grand! With beauty visions of all kinds! Soft flowers bloom like none you’ve seen. There are no greener fields of green. As if ’twas sung by a Queen Bird. Sparkles rainbow, just like a jewel. And tasty grand’s the fruit to eat! And night time skies show stars that dance! ‘Tis rarely to this Land we go. No matter if it might not show. As God has given us this trust. ‘Cause to steal gold, no one does care. Are what you find here…does not cease. Whose mem’ry lives within us…know. Our sight’s now dulled by “fog” that’s dense. All its trees, sea, air, and flowers. ‘Twas crafted by God’s Hand, Divine. And no one will then ever die! And share our joy at every chance! And we’ll never be feelin’ sad. And be in Peace for every day! 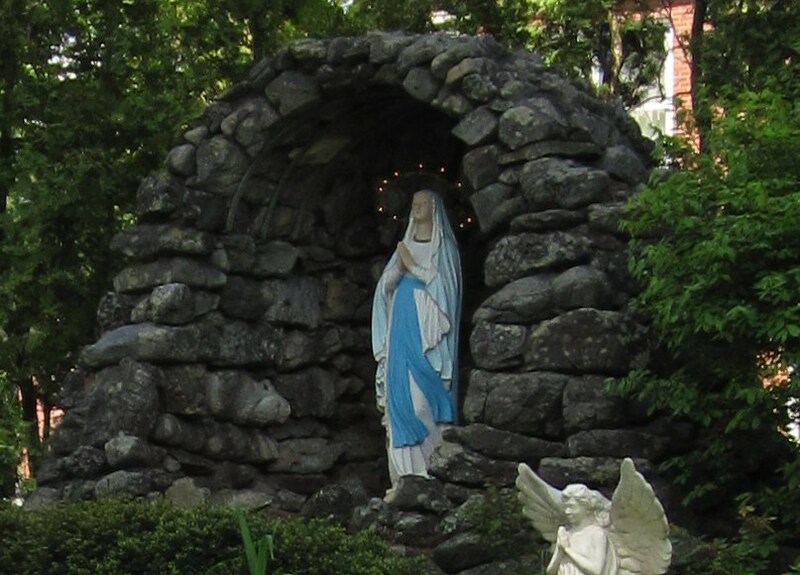 Today is the Feast of Our Lady of Lourdes! Our Blessed Mother Mary is the Golden Rose, Queen of Ireland! Immaculate Heart of Mary, please pray for each of us! Sacred Heart of Jesus, please bless each of us! Happy Feast Day of our Queen of Heaven and Earth, all the Angels, and the Saints! And thank you for visiting Finney and Me! Well…our little Finney was just hidin’ and hidin’ on us! I guess if there is one thing most of us have heard about leprechauns, it is that they seem to always have someone chasing after them to catch them and steal their gold! Our Finney knows that we would never do that to him, but would certainly try to help him in every way we can! that he could hide behind! My goodness, we have our work cut out for us trying to help little Finney and keep him safe and free from being a victim of gold-thievery!!! 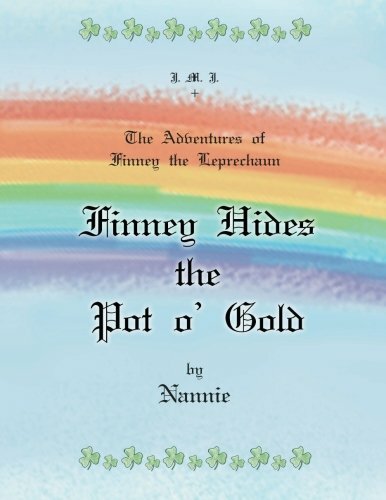 But we are not the only ones who try to help Finney and his fellow Leprechauns! “Leprechauns Are Protected Under European Law,” we continue to read that…”Leprechauns, or little people, and their heritage are protected on a European directive (European Habitats Directive – 2009) thanks to a group of lobbyists from Carlingford, Co. Louth…The directive was part of an effort to preserve the rich bio-diversity of the area called ‘The Sliabh Foy Loop,’ now a protected area for flora, fauna, wild animals and leprechauns.” It goes on to say, “It is a long, detailed procedure and it has taken nearly eight years to secure the future of our heritage, culture and folklore. We are delighted in the knowledge that our little people will be protected from extinction and allowed to thrive on the mountains,” local man Kevin Woods said of the directive, in 2011. There are also two youtube.com videos about the Carlingford leprechauns, about 2 1/2 minutes long, which are well worth the watch! The previously mentioned Mr. Kevin Woods, who identifies himself as a Leprechaun Whisperer (the only one left in Ireland!) explains he has dedicated his life to the preservation of the lives of the 236 leprechauns left in Ireland. Mr. Woods explains that there were vast numbers of them once, so great care must be given to help the remaining 236 survive. Just go to http://www.youtube.com, and type Carlingford leprechauns in the search bar, and you will be in for a few minutes of the lighter side of life! One more very fine thing to mention is that, a few days ago, on February 1st, was (and is!) 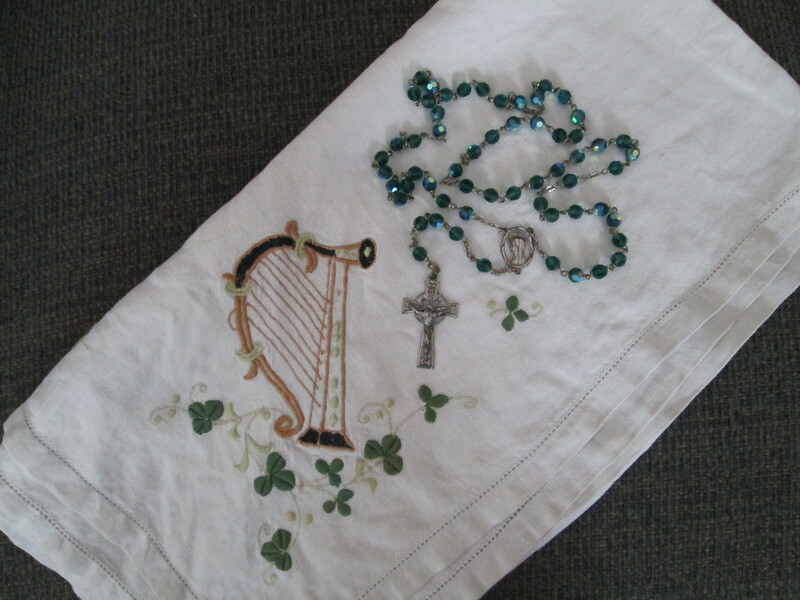 the Feast of the grand and revered St. Brigid! Information about St. Brigid can be found at catholic.org. This text at this website tells us that Brigid lived in the late 5th century and early 6th century, and that she is the patron of Ireland, dairymaids, cattle, midwives, Irish nuns, and newborn babies! Just to finish with a last fun thought about our Brigid…I felt the need to look into this “beer-drinking cows” situation and found that they were a certain type of cow called belted galloways. So…I looked for some Irish connection, and found that this type of cow is, indeed, raised in Ireland, and there are herds all over the country…and one of the most notable herds lives in…Co. Kildare! Yup, just like our Brigid! And…here is a portion of a pic that was generously provided to me by the policeman who took it! Here are 2 of the six party-ing cows enjoying the beer remnant! Behind the rock, above…that’s Me! The forest…near…is where I be! The forest is a lovely place! I, Finney, there, can hide my face! I’m able to…with such great speed! And tunnels are most everywhere! And not too far from the sea, blue! And where I am they’ll never tell. No matter inside or outside! You are my Friend. I know ’tis true. So I can speak of this to you. Sometimes I know that I must hide. That I don’t know…I don’t say hi. I must be wise. I must take care. ‘Cause I don’t know why they be there! When I jump in them…hide from view! I must protect my treasure…gold. ‘Tis been that way since days of old! A Leprechaun can hide quite well. ‘Tis of just this that I will tell. Noone could see me or my hat! And often hide rest of the day! That I don’t lose my hat or shoe! Not hard to see they are my size! Some folks might guess that I am near! If any part of me they see! Just like’s been done in days of old! Though ’tis as grand as any seen! Because it would be right to do. That we protect…since days of old! The way we like at end of day. That our gold treasure doesn’t show! Because this is our sacred trust. And this could happen any day! So that just no one could see me! I could run under a table! Where some grand books could hide meself! If no part of me does, out, stick! Somewhere and hide…not always fun. I would be safe most any day! That in our lives we know God sends. And He wants us to be Friends, too! At different times during life’s days.